The purpose of this writing is to present to you what I call the Potentials and Possibilities of Sound, Music and Color. We have long known of the power of sound, music and color to affect our emotions and moods and ultimately our physical bodies. Tribal music, ceremonial music, devotional music and spiritual chanting are a few well-known examples of how sound can be used to create change. Intense use of ritual chanting can create altered states so powerful that humans in India allow themselves to be intentionally bitten by cobras and do not become ill, and the fire dancers of Java can immerse themselves in huge fires and not be injured. Prisoners of war have endured incredible situations such as starvation, isolation and physical punishment by humming and singing whenever possible to maintain their sense of self and ultimately keep themselves alive. Sound has long been used as a communication tool – since the beginning of time. Native Americans sent messages by drum beats. They developed ritual songs and dances for rain, war, hunting, good harvest, marriages and so on. Whale songs are incredibly complex – some lasting for hours and not repeating patterns. Yet they understand each other. There are a number of researchers currently working with sound looking to affect a change in the physical body and/or the etheric field. There are many sound healing concepts such as: using “missing” frequencies in the person’s voice; using the voice in a harmonic toning way, human energy center (chakra) correlation, and the use of brain-mind/body synchronization frequencies – to name a few. Harmonic Resonance is a way to restore balance, harmony and vitality by offering music and sounds that resonate with you in such a way as to present a vibrational model of you in your optimally resonant state. As our society becomes more information oriented, we are looking for more validation of these phenomenons. What I hope to give you are the tools for you to formulate your own set of guidelines about how to use music in a positive way and, to use sound, music and color in a way that can restore balance and harmony into all aspects of your life. This ultimately can result in improved health, vitality, emotional stability, and a heightened state of consciousness and awareness. This is an opportunity to truly be “in the present.” This comes through clearing the “emotional baggage,” the old wounds (fear, guilt, self-doubt, anger, shame, rage, obsessions, addictions and so on) that many of us seem to carry around from time to time. Sometimes it becomes such a deep part of our personalities that it runs us rather than “us” being totally free to be who we truly are. A sound wave creates changes in air pressure as it moves through the air. Our ears respond to this information and our brains process it into sound information. Stand in front of a good speaker playing low bass or hold your hand under a large drum being played and you’ll feel the air currents moving. We also receive sound information from our whole bodies and energy field. Our skin is very tactile and responds to sound waves quite readily. I refer to sound and music separately. I think of sound as being just that – a more individualized vibration or conglomeration of vibrations. It may or may not have a pitch (specific frequency) or a pure waveform or a temporal (rhythmic) pattern but if it’s audible or perceptible we call it a sound. Music is a combining of elements that typically incorporates these sounds into a lyrical blend of pitch, melody and rhythm and progresses/modulates from one chord to another in an emotionally engaging fashion. Combinations of pitches/chords/intervals that are perceived as being harmonious and pleasant are described as being consonant. Harsh sounding combinations are called dissonant. At this point I would like to say that it is often very important and appropriate to use dissonance of varying degrees in healing music. If you are stuck, sometimes you need a bit of a nudge to move on, and if the musical environment is kept too sweet and cheery then you don’t have as much incentive to journey forward. Major keys are perceived as being light and uplifting. Minor keys are felt as being more serious, reverent, and mysterious. I began piano study at the age of five. One of the first things I noticed was that certain notes on the piano would make certain objects in the room consistently buzz. One note made the tea cups on the shelf buzz, another would make the picture frame over the sofa rattle, another made the storm windows rattle. This was my first awareness of resonance; technically called sympathetic vibration. I call it Harmonic Resonance TM. Gently depressing and holding the middle C key on the piano without making the hammer hit the string (which would make the string vibrate) and then sharply hitting the C below middle C would also cause the middle C string to vibrate through sympathetic resonance. The first harmonic overtone of the lower C is the octave which is the higher C. the vibrational energy from the overtone is enough to cause the note an octave higher to vibrate and be heard. The octave is the first harmonic overtone and its vibrational energy activates the piano string an octave above. Striking a tuning fork tuned to A = 440 Hz and placing it next to another tuning fork that is also tuned to A = 440 Hz will cause the second tuning fork to vibrate. This is a transfer of energy through the air from one tuning fork to another tuning fork. In 1982 I saw some pictures that were in a book called Cymatics by Dr. Hans Jeny. Dr. Jeny took a speaker or transducer and attached it to either a membrane or thin plate of steel and covered this with a variety of substances such as iron filings, silica powder, milk, and water. Smoke-filled chambers were also used. He then played a specific frequency into the speaker or transducer which vibrated the membrane, steel plate, water or smoke chamber and photographed the results. The particles formed incredible patterns with remarkable similarities to naturally occurring patterns in nature. They ranged from moonscape-like images to mandalas (complex symbols used in Buddhist meditation) to stalagmite looking forms. As the frequency was changed, the forms and patterns changed. I thought that the human body must respond this way as well. We are about 65% water (fluid), our bones are excellent conductors of vibration and we have a variety of densities provided by tissue mass, fat, muscle, organs and bones (skeletal system). Given how profoundly sound affects these physical substances, it is easy to understand how our body and spirit takes on the patterns of music and emotion. I feel that the use of low bass in music is extremely important. Bass acts as a carrier wave for the higher frequencies and creates a pathway for healing, life force energy to enter. 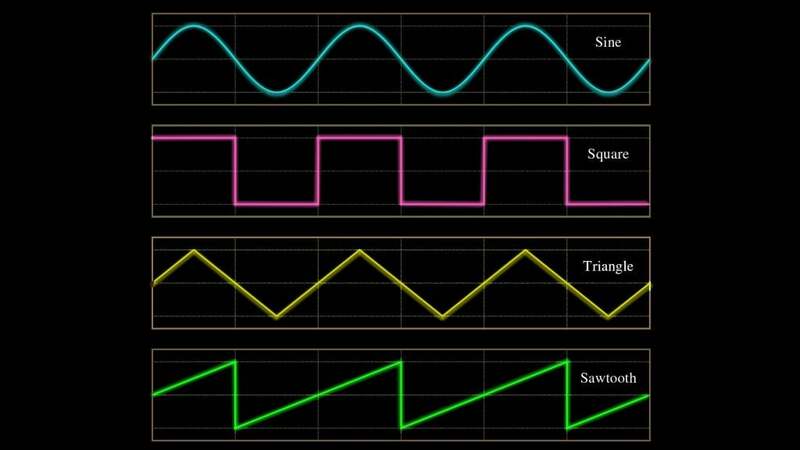 If you view an oscilloscope showing a single low bass sine wave, it will look like a long "S" on its side. Playing a high frequency tone by itself will show a close together wave pattern. Play the high and low tones simultaneously and you will see the high frequency tone actually tracks/piggybacks along the bass note. Very Low Frequencies (VLF) / Extremely Low Frequencies (ELF) in the 3- 30 Hz range among other things, can be used for communication with submarines. If you wish to further explore VLF/ELF then I suggest reading about Nikola Tesla. He was a brilliant inventor that shortly after the turn of this century gave us particle beam physics, neon lights, and AC electricity. He thought Edison to be a tinkerer. Tesla was a true master of “harmonic resonance.” He could bring down a tall building with a hand-held jigger (a mechanical device that produces a reciprocating motion) set to the building’s resonant frequency and located in the basement on a structural beam. Our “earthquake-proof” buildings of today are designed with unequal distances between floors. This disrupts the resonant frequency of the building. This is the same principle as a singer breaking the glass with her voice. You find the resonant frequency of the glass and sing that pitch at high volume (amplitude) and the glass breaks. There is too much energy/molecular activity. This is also how the medical community is treating a great number of cases of kidney stones. Ultrasound is used to break up the stone so it can be passed out of the body without surgery. Tesla had a concept to prevent earthquakes. His idea was to put Tele-Geo-Dynamic machines (giant jiggers) along the fault lines and this would keep them in a state of flexure thus preventing the buildup of tectonic plate stress that eventually “lets go” and causes breaks in the faults which causes earthquakes. In Los Alamos, NM, at a national laboratory known for atomic energy research, they explored brain function with a technique called tone mapping. According to their studies, specific bundles of neurons in the cerebral cortex of the brain are activated by specific frequencies. This is observed and measured by Neuro-Magnetic-Resonance-Imaging, similar to a CAT scan. Here’s a fun experiment I often do in workshops which illustrates the vibrational “pull” of sound. You face a partner, put your ears together (one person’s left ear to the other’s right ear). Use your hands to cover the other ears. Give the “A” person a tone to hum and the “B” person a different (dissonant interval) tone to hum. It is almost impossible for most people – even trained singers – to maintain this dissonant sound for long. In a matter of a minute or less most every “A” & “B” were humming each other’s tones and within a couple of minutes everyone in the room begins humming the same tone. It is in our nature to be in harmony with our environment. We may challenge it for a while but in the end a resolution occurs. If not, then what can happen? You guessed it; “DIS-EASE.” Our body/beings want to be in harmony with their environments and most importantly with each other. The unification of Body, Mind Spirit and Emotion is essential. While pondering the nature of the universe and the essence of life, I came to the conclusion that everything is vibrational in nature. In matter, there is an atomic structure with a nucleus with electrons and protons circling in a specific, “harmonic-resonant” pattern. Thinking of disease, I reasoned that disease is “dis-ease,” “dis-harmony,” “dis-stress,” “dis-torsion,” “dis-sonance,” “dis-illusion,” “dis-connection” (fragmentation of the psyche). They are synonymous for the same thing – not being whole, connected and integrated. I did considerable research with a number of massage therapists and alternative health practitioners. Using Kinesiology, acupuncture pulses, and other testing methods, a capable practitioner can do an assessment of everything from metabolic function to emotional involvement. We then find the specific frequency (pitch) and waveform (instrument) which when played, will restore balance to the area affected. Muscles which tested very weak before the music treatment – your little finger can sometimes push down the entire arm or leg – often show remarkable changes in strength and muscle reflex response. They become so strong that while the tones are playing and you can lift yourself off the ground using the same previously weak muscles. This demonstrates that the sound is doing something very profound. I then compose a 30 – 45 minute long piece of music based on the specific frequencies and waveforms that demonstrate the balancing and vitalizing responses. The specific sounds address the specific areas, but the combination of the sounds into “music” is what gets the emotions involved. Allowing for an emotional and soul level healing creates the opportunity for a complete physical body healing. The client receives a CD of their custom music to play for themselves regularly for ongoing benefits. One client was scheduled for a series of root canal procedures in two teeth. He was so sensitive to the analgesic drugs typically used to manage the pain that he was duly concerned. I said I’d make him a tape of sounds and music that would numb his tooth and displace the pain. We found the frequencies of the affected teeth and then found the frequencies of certain acupuncture points that provided an outlet for the pain. It worked and we were on to something. Another client was an insulin dependent diabetic. She brought her blood glucose testing device over. After fasting that day, she had a blood glucose level of 192. She took no insulin that day, and drank a 12-ounce glass of sweet, carrot juice just prior to the session. After the session her blood glucose level was measured at 120 (the “normal” zone is between 60 and 160). According to her past experiences, without insulin her glucose level would usually have gone into the 300 range. Experiments showed that we respond to sounds that we cannot hear. We put the selected sounds exclusively into a pair of headphones and put them on person’s ankles. They responded to the sound even though their ears could not “hear” the sound. Once you vibrate a part of the body the blood cells carry this resonance to the whole body very quickly. Research done with deaf children also showed that the children could identify different sounds and instruments by laying on a giant membrane and having the sounds played through it. First and fore-most it is important to establish a clear intentionality. When you listen to the music be aware of where the sounds resonate in the body. Be aware of how the music affects your emotions and moods. I feel that we select the music we need on a subconscious level just like we select the clothes we wear with consideration given to their colors and textures. Music too is comprised of color (frequency) and textures (waveforms). At the completion of the listening experience it is important to sit in complete silence for at least 10-15 minutes or more for integration. The resonance builds with each experience. Allow yourself a quiet place to immerse yourself into the music – no distractions (phones, TV, etc.). Turn your sound system up to a good, solid volume level that vibrates you thoroughly (don’t over do it and injure your ears and speakers). Adjust the bass so it is deep and full, set the treble so that the higher frequencies are clear and crisp. I prefer speakers to the “personal portable” headphone systems. Listen to each piece of music without interruption. I suggest listening regularly - five days a week, one or more times per day and then having two days off for processing and integration. Allow yourself to stay grounded and resonate with the earth’s core as you discover your soul’s path. This is music created to help you to discover and clear the blocks that are in the way. Breathe the music in. Sometimes there are passages that “dance.” This creates movement along a sonic pathway for the energy to ultimately clear. Some passages have a slightly offset rhythm to help to loosen fixed patterns. Other passages are majestic and profound. This is your initiation to yourself – your coronation – your celebration of being alive. Allow yourself to receive. There are choirs of voices that welcome you home. The music weaves a tapestry between major and minor keys – lofty to deep. There are sections of intertwined repeating patterns which you could imagine to be like re-patterning DNA and restructuring areas of cellular disruption. The stereo image is very wide in places and narrower in others to give a variety of perspectives. I often slightly detune a synthesizer’s oscillators 5 – 20 cents to give a warm chorusing effect which also creates beat frequencies which help you to relax more quickly and completely. Some sections are very melodic and others are more open. This openness allows you space to make up your own “song” within this music. Please sing or hum along with the music if you wish. Get up and move and flow with the healing sounds. Give yourself permission to participate in life fully. One of the things I strive for is to create enough space for the listeners/ participants to feel welcomed into my music. It becomes truly interactive. Acknowledge your emotions as you flow with the music. Sing, dance, laugh, cry… fill yourself with as sense of your-self. I feel that our bodies generate the sounds they need but sometimes they get too run down to do it without help. This is like a musical jump-start. People often ask me, “Does the music change on the CD/MP3/tape?” “I have listened to this CD daily for weeks and it sounds different each time.” My explanation for this is that I feel that our attention is often drawn to areas of resistance and as this resistance is lessened and eliminated through the healing process our focus then shifts to other areas of resistance that the music then works at releasing and so on. This leaves you feeling empowered, revitalized, grounded and centered. As previously mentioned there is a generous amount of low bass in the music. A great deal of consideration went into the harmonic content of this music. Harmonic overtones are basically the subdivisions of a string. If a string was 8′ long, the first subdivision would be in half – the octave at 4′. These 4′ subdivisions then subdivide again at 2′ and so on. This is called the harmonic overtone series. In the waveform department I use three basic groups: Sine/triangle waves (flute type sounds) have no overtones; square waves (woodwinds) have odd overtones (1, 3, 5, 7, etc. ); and sawtooth waves (brass) have odd and even harmonics. One reason that I like to use synthesizers in this work is that you can control the harmonics by changing waveforms – an easy thing to do on the older analog synths. The Mini Moog, Memory Moog and Roland Super Jupiter are excellent for this. They have independent oscillators (sound generators) for which you can choose the frequencies and waveforms independently. In the studio I have an assortment of analog and digital synthesizers as well as an extensive orchestral digital sample library. Analog synths are very warm and full. Digital synths have a bright, crisp and very complex sound structure. For personal music pieces, the sampler enables me to digitally record a person’s voice and then play a choir of their own voice – in pitch – when and where appropriate. We sometimes get caught up with regrets about the past and have great anxiety about the future. Music can help heal the separation this creates and allows us to truly live in the present. Learning to flow is a good use of energy. It’s hard to dance the foxtrot when the band is playing a waltz. Thank you for allowing me to share some of my ideas about music and sound with you. I am most grateful for the opportunity to create the accompanying music. It continues to be a truly magical experience.